Top 5 online business opportunity from home without investment. We all know nowadays opening a business is not child’s play. It requires a huge investment with a high risk of losses. 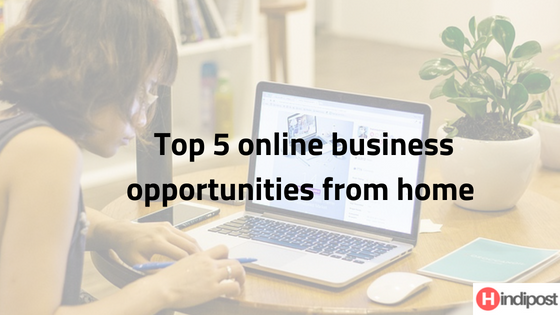 But don’t worry here are few online business opportunities from home which need almost no investment. You can use your skills and knowledge and get your online business started. There are many companies which are ready to share a fair amount of their profit. If you are good at internet marketing and already have a personal website where you have lots of visitors then it’s a very good opportunity not to be missed. It is a very good business opportunity who are very passionate about working from home and have basic computer knowledge. Many small business owners don’t have any idea about the importance of SEO (search engine optimization) on their business. If you can educate those business owners and how it will change and transform their business in the current market scenario. Now it is an era of social media almost every person is on Facebook and Twitter. You can create your business page and promote them on social media. But lots of small business owners do it on their own though they have less knowledge of effective posting and they are too busy to post on a regular basis. So if you can show them differently by regular and effective posting to target the right audience it will help to grow their business so yours will grow. No matter which diploma or degree you hold. You can work for multiple companies at the same time as per your knowledge, experience, and skills. Now most of the companies looking to fulfill their skills gap with a freelancer. It helps them to cut the cost and gives you opportunities to work from home. If you are experienced and have good knowledge in any field which can help other people worldwide then writing a blog could be one of the best options. You can share your experience and knowledge in your style. If it is proved to be helpful to the audience you will have a bright business future. Friends, if you like my post on the topic of an online business opportunity from home without investment, you can like, share and comment.